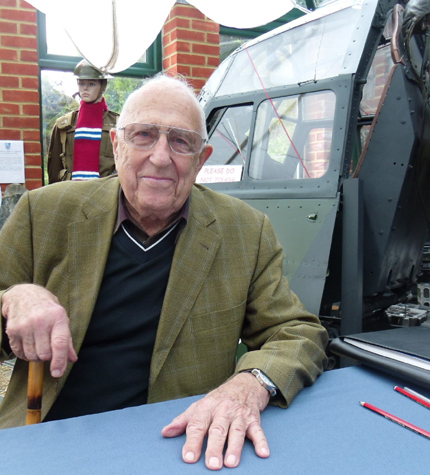 On Sunday 29th September 2013, the Museum had the very great privilege to welcome Werner Mörath to Shoreham. The veteran Luftwaffe Junkers Ju88 pilot had been very keen to see the Schnellbomber cockpit project, and Werner had many amazing stories to tell relating to his flying experiences after joining the Luftwaffe in 1941, to qualifying as one of the youngest German torpedo-bomber pilots with II Gruppe, KG 26 Löwengeschwader – all spoken in very good English. He learnt the language as a prisoner-of-war when he realised the many advantages it provided by being an interpreter between his fellow PoW’s and the Allied guards. Werner very kindly gifted a fantastic item to the Museum for the Schnellbomber project, an item that he used to navigate by and also one which when possible was always retrieved after a crash-landing! 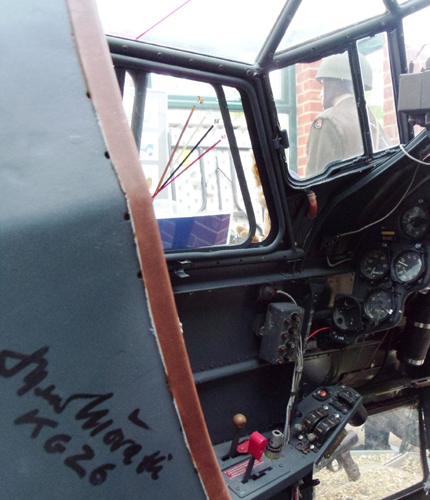 To round off an excellent day, Werner signed the pilot’s seat in the Schnellbomber cockpit. 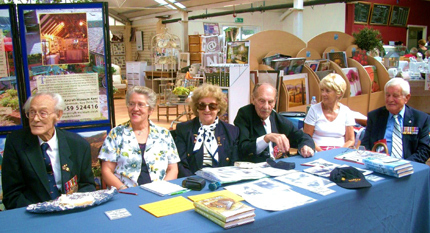 A veterans signing event was organised at the Hawley Garden Centre near Dartford on Sunday 1st September 2013 and the veterans who very kindly turned out included Rodney Scrase DFC (Fighter Boy), Ron Liversage MBE (Bomber Boy), Denise Edwards née Franck (of the “Listen very carefully, I shall say this only once” Belgian Resistance), Harry Verlander (Special Operations Executive), Sid Beaver DFM (Bomber Boy) and Don Robson (Bomber Boy). An enjoyable day was had by all and more than one visitor to the garden centre departed not only with a potted plant, but a treasured signed memento as well. You are currently browsing the Shoreham Aircraft Museum – News archives for October, 2013.